Leaked local government documents show that UK spy agencies are gathering information on “pro-Palestinian activity” as part of controversial “anti-terrorism” strategy Prevent. Obtained by civil rights group CAGE, the documents are part of an aspect of Prevent known as Counter-terrorism Local Profiles, or CTLPs. 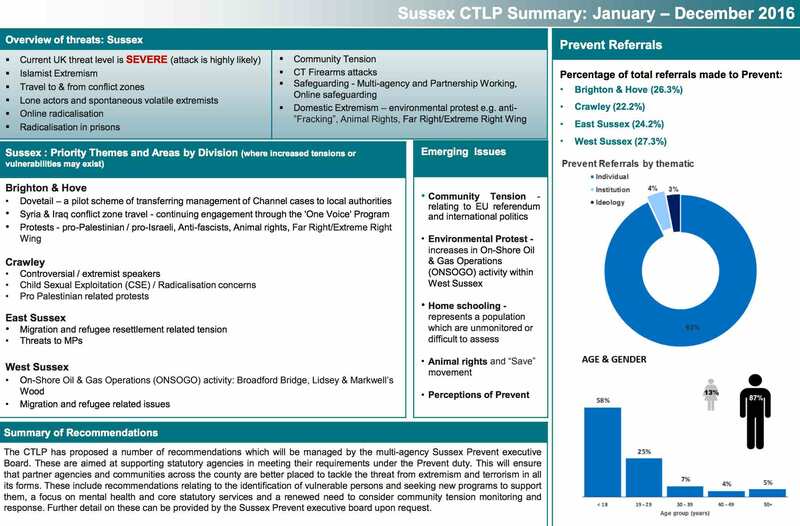 A summary of the CTLP for Sussex, on the south coast of England, shows that one of the “priority themes” in Brighton and Crawley is “pro-Palestinian” protest. The documents also include a range of other legitimate protest groups as being of concern under “counter-terrorism,” including “environmental protest” and anti-fracking groups. The liberal coastal city of Brighton is home to an active Palestine solidarity scene, and a particularly active chapter of the Palestine Solidarity Campaign. In 2014, a branch of Israeli company Sodastream in the city had to close, after a sustained two-year campaign by local activists made the brand toxic. Sodastream at the time operated a factory on occupied Palestinian land in the West Bank. CAGE has called for the scrapping of Prevent as inimical to basic human rights. The new documents show the policy goes “well beyond preventing political violence, and into the realm of pre-crime and the criminalization of dissent and political and/or religious activism,” the group said on Thursday. The summary documents obtained by CAGE are two examples of those given to the heads of local governments in the UK. A 2010 report by Parliament’s local government committee described the CTLPs as an “intelligence product” – in other words they are documents compiled by the UK’s spy agencies. Prevent’s targeting of Palestine solidarity campaigning has come under scrutiny before. CAGE also obtained a questionnaire sent to government-funded public sector workers, which is used to compile the secretive profiles. One of the questions asks respondents to list “emerging issues around communities, groups and individuals” involved in “anti-Israeli/pro-Palestinian activity” or anti-austerity, anti-war and animal rights protests. The Prevent strategy was introduced by a Labour government in 2003. It has come in for increasing criticism in recent years for its overwhelming targeting of Muslim communities, and for being institutionally Islamophobic. Examples abound of the chilling effects of the strategy, even though most victims are likely cowed into silence. In July 2015, one schoolboy was referred to a Prevent program and labeled “extremist” for wearing a “Free Palestine” badge. A pamphlet encouraging the boycott of Israel by Palestine solidarity group Friends of Al-Aqsa was deemed by police to be evidence of “terrorist-like” views, according to the boy. The schoolboy was later named as Rahmaan Mohammedi. Now 18, Mohammedi has since gone on to be a vocal activist against Prevent. It was in Manchester during last May’s British general election campaign that a suicide bomber targeted a pop concert, killing 22 people. The bomber, Salem Abedi, was the son of a man who went to help overthrow the government of Muammar Gaddafi in Libya in 2011. Ramadan Abedi was among a number of Libyan exiles recruited by the British spy agency MI5 to go and fight in Libya as members of the al-Qaida-linked Libyan Islamic Fighting Group. Journalist Max Blumenthal described the bombing as “blowback” from Western interventions in the region, underscoring that the intelligence agencies ostensibly tasked with preventing violent extremism have actually been fostering it. Yet that seemingly critical aspect of the attack in Manchester has been swept under the carpet by British authorities. Jeremy Corbyn, leader of the main opposition Labour Party, described Prevent earlier this year as “often counter-productive” and implied in a 2015 interview with The Electronic Intifada that he would like to see it scrapped. This sets a dangerous precedent and marks “a complete abuse of due process and a dire threat to civil society,” the group added. Prevent seems to succeed only in alienating Muslim communities, and has done little or nothing to prevent atrocities such as the Manchester bombing.